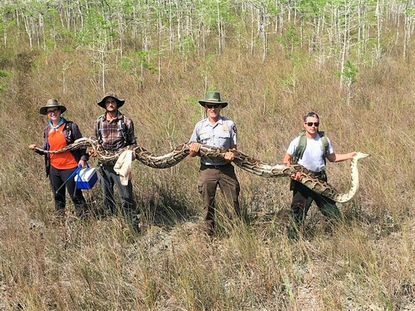 The "new approach" that led to the capture of this enormous python involves outfitting male pythons with radio transmitters. The picture posted on Facebook shows it took four people to hold up the behemoth. "Using male pythons with radio transmitters allows the team to track the male to locate breeding females", the statement said. Florida has used other methods to manage the python population, including encouraging the humane killing of pythons on private property and at 22 wildlife management areas, including Big Cypress. The searchers found only 68 snakes. The female python that wildlife officials found last week contained 73 developing eggs.